No matter where you are headed in Niagara Falls or what great attractions you have planned for the day, you should always be sure that your group is well-fed to avoid mood meltdowns and temper tantrums due to low blood-sugar. There is nothing worse than cutting a trip short because you didn’t plan a stop for lunch and everyone is much too tired and grumpy to keep seeing the sights. That’s why we’re offering you a list of our favorite food stops around Niagara Falls. These cheap, delicious, and easy cafes, diners, and eateries should hit the spot, keeping you full and focused as you explore our city and surrounds. If you are craving familiar Italian food at a fabulous price, Zappi’s is definitely the place to go. This spot has been providing locals and tourists with fresh, fantastic pizzas and sandwiches since the 1970s, so you know you’ll be getting a quality meal when you stop in for a midday meal. The chefs at this Niagara favorite strive for authenticity and excellence in every meal. Serving classic European dishes like goulash, schnitzel, and crepes, Savoury & Sweet effortlessly mixes traditional tastes with contemporary style and affordable prices. Two borders might separate Niagara Falls from Mexico, but that didn’t stop Quesada Burritos and Tacos from opening up a Mexican food stand in the Niagara heartland. In fact, most patrons are astounded by the genuine taste of the restaurant’s fresh-daily salsas and guacamole. If your energy is flagging, you can easily renew your excitement with a trip to Hershey’s Chocolate World, one of the world capitals of rich, chocolaty goodness. This shop has everything a chocoholic needs to sustain themselves for a long vacation ahead: novel baked goods, thick milkshakes, silken fudge, and any type of Hershey’s candy you can call to mind. While you might imagine this spot as a pit-stop on your daily itinerary, it’s easy to spend hours tasting every treat you lay eyes on. A favorite for kids of all ages, the Rainforest Café transports diners to the depths of the tropics with the sights and sounds of the Amazon. However, the smells will be pleasantly familiar, as the café’s available fare is crowd-pleasing food like burgers and salads. Travel is fun, but every so often you want to find a spot that reminds you of home. Whenever you feel homesick on your Niagara vacation, head straight to Betty’s where everything from the lighting to the food is designed to make you perfectly comfortable. Betty’s Restaurant has thrived for more than 45 years, and locals claim it is the best place in the city to enjoy a meal. Plus, Betty’s pie has won countless awards, so you should be sated from appetizer to dessert. 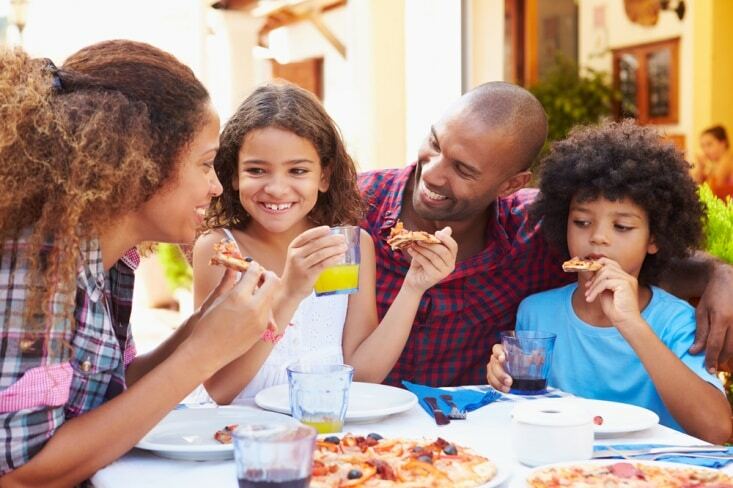 Families go crazy over the delicious and nutritious dishes available at Perkins. Their entire menu is available all day long, so if you start to crave waffles and eggs after Niagara’s nightly fireworks show, you know exactly where to go.